WASHINGTON, DC, February 16, 2012 (ENS) – New Jersey already has 144 Superfund sites, more than any other state, but it could have even more according to U.S. Environmental Protection Agency documents obtained through a lawsuit by Public Employees for Environmental Responsibility, a national alliance of state and federal agency resource professionals. Twenty-seven contaminated sites in New Jersey pose risks equal to or greater than sites placed on the Superfund National Priority List and scheduled for cleanup, yet the EPA has not added these uncontrolled sites to the list, PEER has determined. PEER sued the federal agency in late October under the Freedom of Information Act after the agency failed to turn over the Superfund Hazard Rankings for non-listed sites in New Jersey. The Hazard Ranking System numerically scores risks to public health and the environment from exposure to contaminated groundwater, surface water, soil and air. Sites that score above 28.5 points on the Hazard Ranking System qualify for Superfund listing. Documents surrendered to PEER by the EPA as a result of the lawsuit reveal 27 New Jersey sites that score greater than 28.5, with scores ranging from 30 to 70 on the Hazard Ranking System scale. Some of these high-scoring sites that have not been listed are in Pompton Lakes, Fair Lawn, Plainfield, Gloucester, Berlin and Union Township. Scores reflect releases of high levels of chlorinated solvents and other toxic chemicals to soil and groundwater resulting in off-site pollution of residential and municipal drinking water; seepage of toxic vapors into nearby residential buildings; and contamination of adjacent wetlands, streams and lakes. EPA’s decision to bypass these sites leaves the sites under state auspices but the New Jersey Department of Environmental Protection has a history of prolonged but ineffective cleanups,” says Wolfe. This list of passed-over toxic sites in New Jersey may grow even longer. PEER is still litigating to force EPA to disclose the Hazard Ranking System scores for other sites where its National Priority listing decision is still pending. “EPA has yet to explain why it decided not to list sites that otherwise qualified for Superfund and why it deferred cleanup oversight to what its own Inspector General found was a failed cleanup program,” Wolfe said. “The people of New Jersey have a right to know how these critical decisions are made and whether EPA or the Governor’s Office are delaying or derailing Superfund listing,” he said. 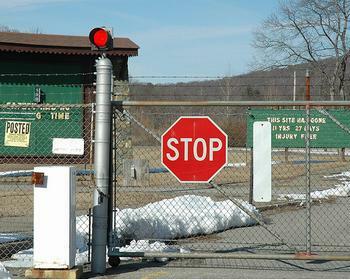 As a site that requires immediate federal intervention, Wolfe points to the shuttered DuPont explosives factory in Pompton Lakes, New Jersey, which is still suffering from the worst vapor intrusion in the nation. In the 1980s, toxins were found in the groundwater below more than 400 homes in the area. Results of tests on Acid Brook, which runs through the DuPont site, released by the EPA on February 1, reveal elevated lead and mercury in sediments and the solvent PCE in water more than 15 years after the company and the EPA said the tributary had been cleaned. DuPont and the EPA say investigations into how to best remediate the site are still in progress. EPA officials said the mercury and lead levels shown by the tests were below the threshold deemed harmful to humans.